Yesterday I decided I should treat myself for getting through yet another week of school. I thought this would be something fun to blog about so I guess I will be taking you along with me during my "pamper routine"! I was looking through my little lush collection of bath bombs and was debating on what I wanted to use and I was feeling kind of pink... 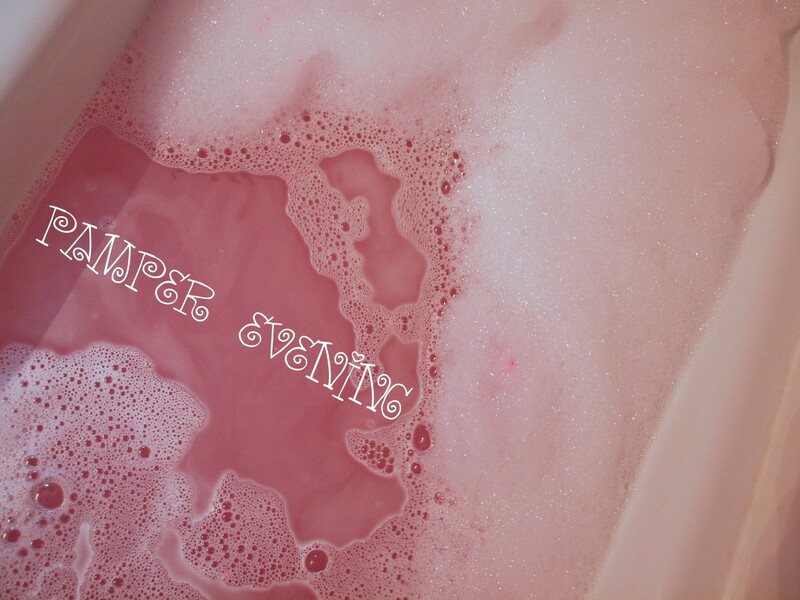 If you can even feel pink haha, and I chose the comforter bubble bar. This smells so amazing you seriously need to get your hands on this! 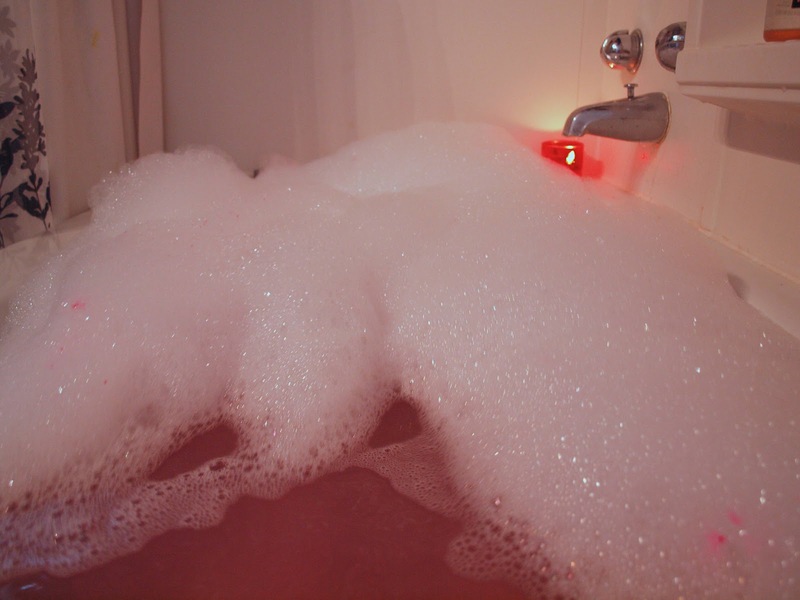 I cut mine into quarters because its fairly large and I don't think my tiny bath could handle that many bubbles. 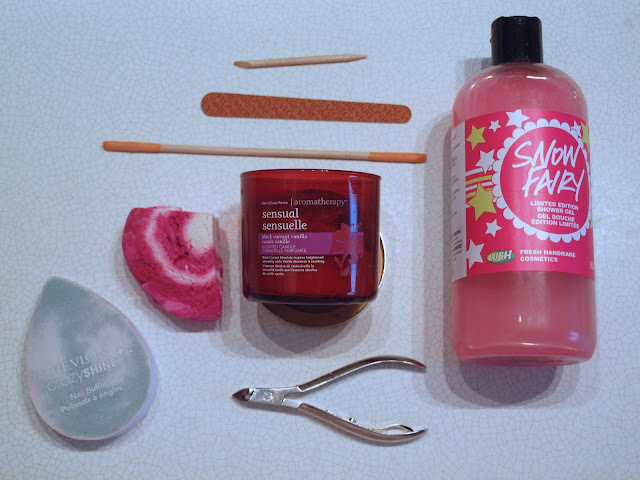 For extra pinky smell (I guess I can smell pink too) I put a little bit of my snow fairy shower gel into the bath! I also have a candle from bath and body works that I usually burn while I am having a bath because it is a really nice and calming scent. I don't usually do my nails in the bath, but I decided to be a bit different and try it. So when I do my nails I use a cuticle stick, nail file, some sort of nail file that you use for the sides of your nails which I have no clue what it is called, my revlon crazy shine nail buffer, and some cuticle cutters. 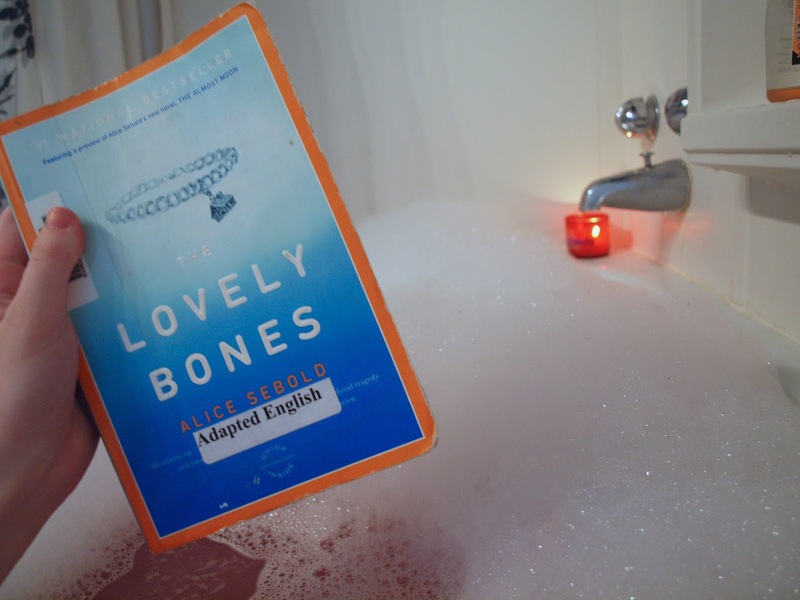 So I first just relaxed in the bath with my book which I am currently reading for english and made sure I was submerging my feet in the water to make my heels nice and soft. After reading a chapter or two, I put my hands under water for about 5-10 minutes to soften the cuticles. Next I pushed back my cuticles with my cuticle stick and cut my cuticles... bleh. I then put my hands under water once again for about 2 minutes just to soften my fingers once again, also because I cut too much of my cuticles and bled a little bit so don't be like me and go crazy. Now that my fingers were no longer bleeding, I used my nail file type stick and gently ran it along the sides of my nails to get whatever cuticles I left behind. 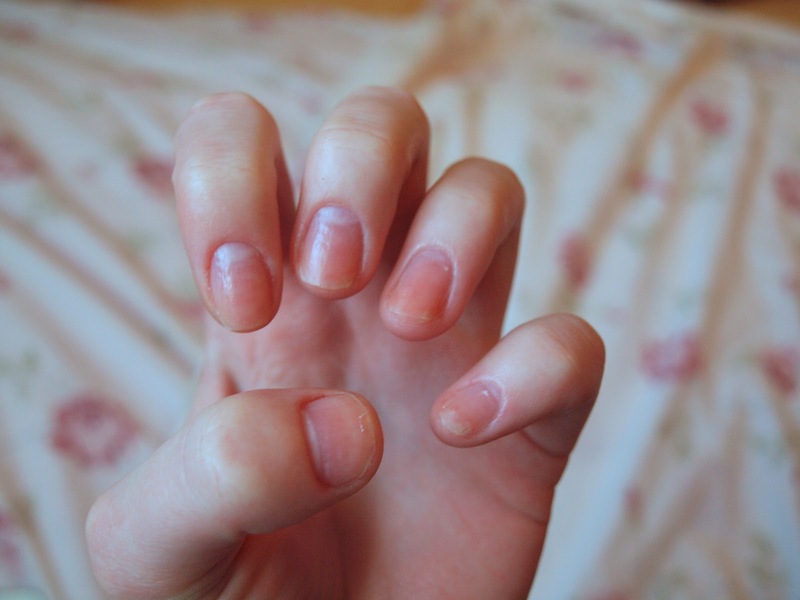 Once that was over I filed my nails, which is pretty straight forward. I didn't need to file too much because my nails are pretty short at the moment... sadly. Okay so now that my nails are sanded down, I used my nail buffer to get some crazy shine! My nails are done for now, so I relaxed in the bath for a little bit longer, exfoliated my feet, then got out. 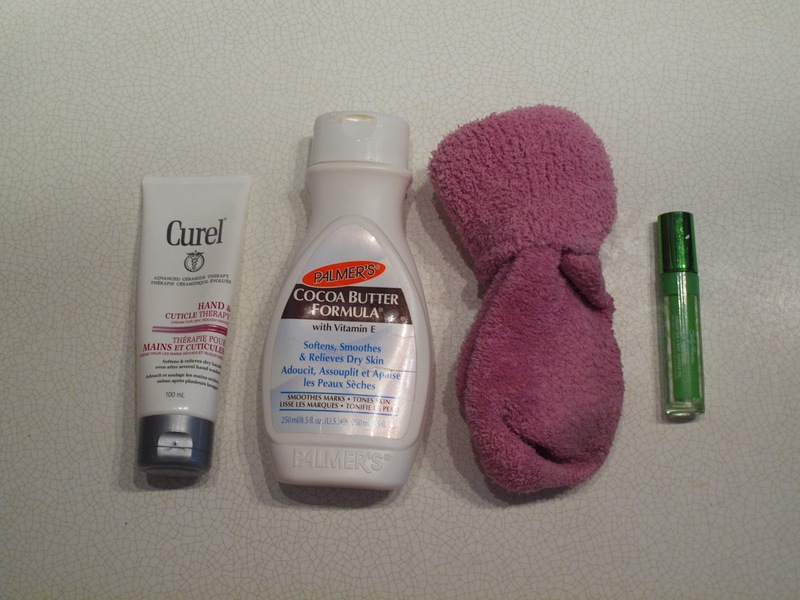 Once I was out of the bath I lathered myself up with my palmers cocoa body butter applying extra to my feet and put on the fuzziest socks I could find. Then I put my curel hand cream on my hands and my sally hansen cuticle oil to make my cuticles extra soft. This is the hard part... Deciding which nail polish you want to use. 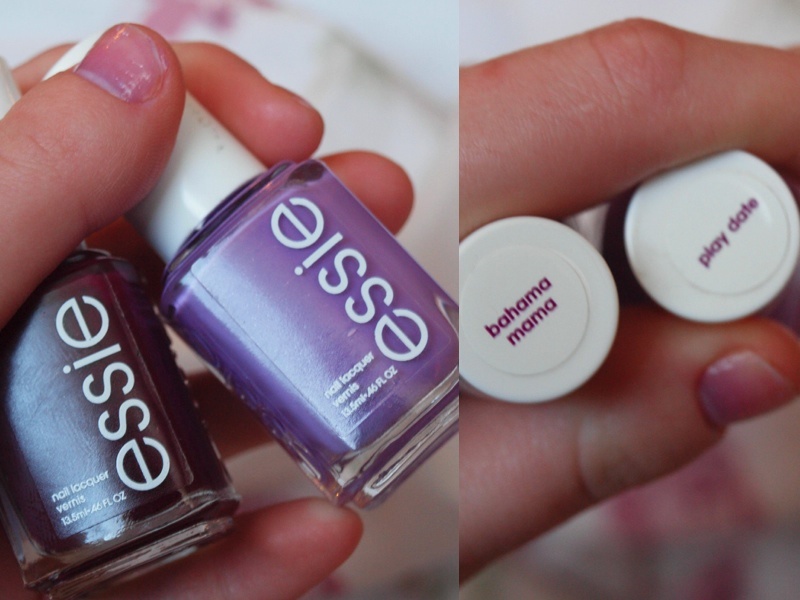 I wanted my nails to be purple but I didn't know whether to go light or dark. 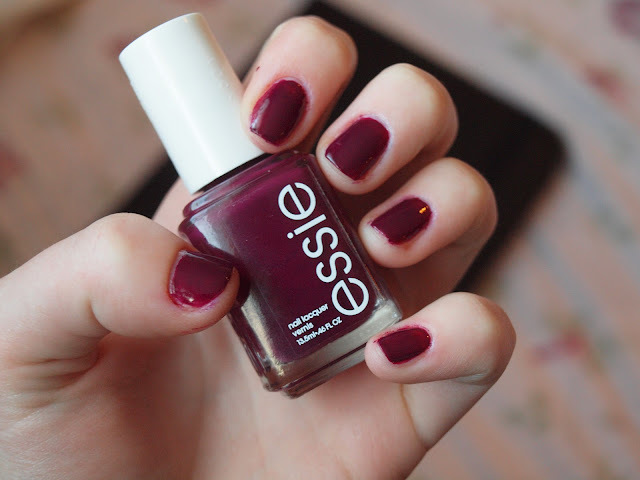 But I went with dark because its still considered winter time and I should stick to dark colours for now. 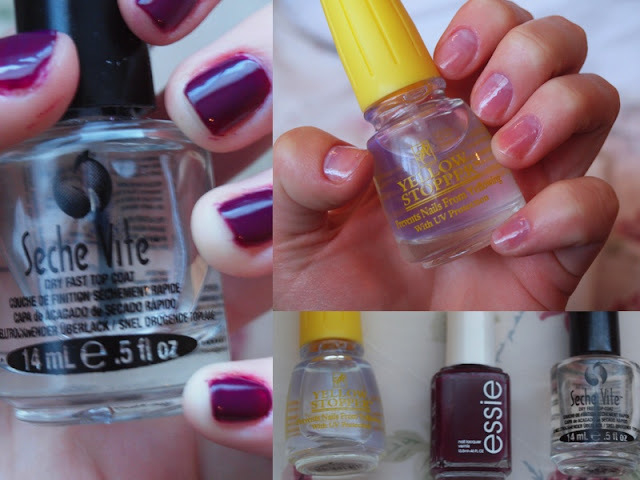 I used a base coat that is supposed to prevent your nails from yellowing, and the seche vite fast dry top coat after my nails were painted. Which I have a love hate relationship with because I love how quickly it dries but it chips off so easily. One time I painted my nails, had a shower, and 3 fingers chipped, and not just a little chip at the corner, literally the whole nail of polish came off. So I think after I am done with this I am going to try a different seche vite top coat that isn't quick dry although that is my favourite part of this top coat. Thank you! Yes I kind of thought that played a part in it, and thank you for the tip! :) I will be sure to do more!